England World Cup winner Josh Lewsey will step down from his role as Welsh Rugby Union's head of rugby in January. The former Wasps utility back succeeded Joe Lydon in September 2013. Lewsey has been responsible for the operational and strategic management of the game in Wales - from community to elite level outside the Test squad. The 38-year-old said he felt "honoured to have worked with some special people" and added "personal matters" had contributed to his decision. "Collectively we should feel very proud of the progress we have made," he said. A World Cup winner in 2003, Lewsey retired in 2009 after winning 55 England caps and making three Test appearances for the British and Irish Lions, on the tour to New Zealand in 2005. His announcement came about three hours after Stuart Lancaster left his post as England head coach. Fellow World Cup winner Lewis Moody suggested Lewsey could be interested in replacing Lancaster. "I can't imagine for any reason Warren Gatland wanting to leave his position with the Welsh Rugby Union," Moody told BBC Radio Wales. "There is another person there - Josh Lewsey - working under Gatland, and I'm sure he might fancy a sniff at something like the England job." 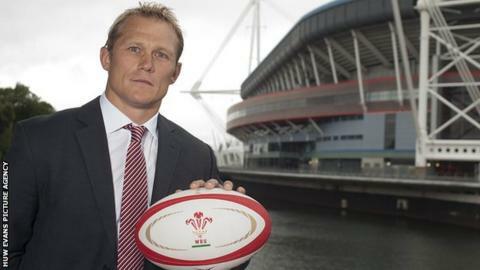 Welsh Rugby Union Group chief executive Martyn Phillips said Lewsey had brought "dedication, energy and vision" to the role. "There is no doubt his principal achievement across the past two years has been to drive strategic change and put in place a club hub structure which is already proving successful in introducing a new core of young players into the game," said Phillips. "Before he steps down from the WRU, he and I will work on the succession planning in order to maintain the momentum he has created for the game in Wales."